NAMM 2014: Seymour Duncan to unveil Willie Adler signature pickup? NAMM 2014: Lamb Of God's innovative rhythm guitarist, Willie Adler has revealed to MusicRadar that's he's working on a signature humbucker design with US pickup firm Seymour Duncan. We caught up with the guitarist before the Virginia metaller's massive London show at Brixton Academy on 18 January and he gave us some early information on his brand new signature 'buckers. "I insisted on Duncan '59s [on my ESP signature model]", said Adler. "And now we're doing my own signature pickup based on the Duncan Distortion. 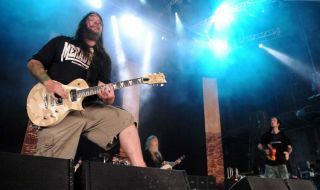 I'm working with Duncan on the pickups and, hopefully, tying Duncan and ESP together so we can put them in the guitars." According to Willie, going into the design process, the aim was to augment the hot output of Seymour Duncan Distortion ceramic-based 'buckers with the more old school tone of the firm's PAF-aping '59 Model pickups. "With the voicing, I wanted to get almost like an active output, but still with the warmth of a passive pickup," the guitarist told MusicRadar. "What I've found with the Duncan Distortions is that it's really high output, it's really gain-y, so we decided to put covers on them, which did everything that I thought it was going to do: it warmed them up and it gave it that kind of passive, tube feel to it, so it's kind of like a mix of the Distortion and the '59 combined." It's still early days - the official name, price and release date are still to be confirmed - but we may see the finished product unveiled as soon as the forthcoming NAMM show. When the pickup does arrive Adler will join a prestigious list, including the likes of Slash, Gus G, Yngwie Malmsteen and Synyster Gates - all of whom have their own signature models with Seymour Duncan.